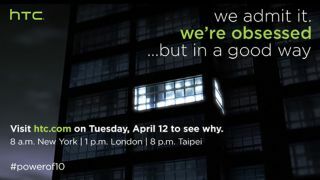 HTC's next flagship phone to be revealed 12th April | What Hi-Fi? The HTC M10 is likely to be the new HTC phone - we'll find out for sure via an online stream on 12th April. HTC's announcement doesn’t give too much away, but the “power of 10" hashtag suggests the rumoured HTC M10/ HTC 10 model name is a solid bet. We've been impressed by HTC's previous smartphones, praising the One M9 for its high-quality build, sharp screen and hi-res audio support. The sound quality itself and the battery life have often let it down, so we're hoping these problems will be rectified with the latest model. Specs for the phone have yet to be announced or leaked, but we expect a full HD display, although given LG, Samsung and even Sony have dabbled with 2K and 4K screens, it would be nice to see HTC make the jump in resolution too. The live stream will take place on Tuesday 12th April at 1 p.m. GMT.